If you have little ones at home, you probably find yourself looking for things to keep them busy while you’re doing something else, like making dinner, folding laundry or helping other kids. 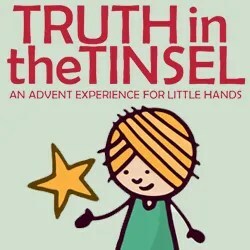 It’s a bonus when those activities are educational and don’t involve a screen! 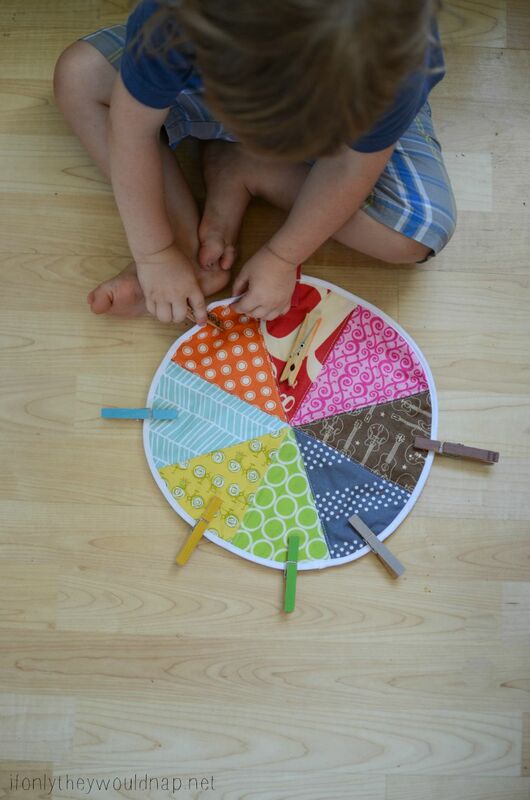 I made this Color Wheel Matching Game for my preschooler and toddler, and I use it to occupy my littlest boys while I’m homeschooling the older ones. You can use it any time including in the car! 1. Cut out 8 triangles – the short sides should be 6 3/4in. 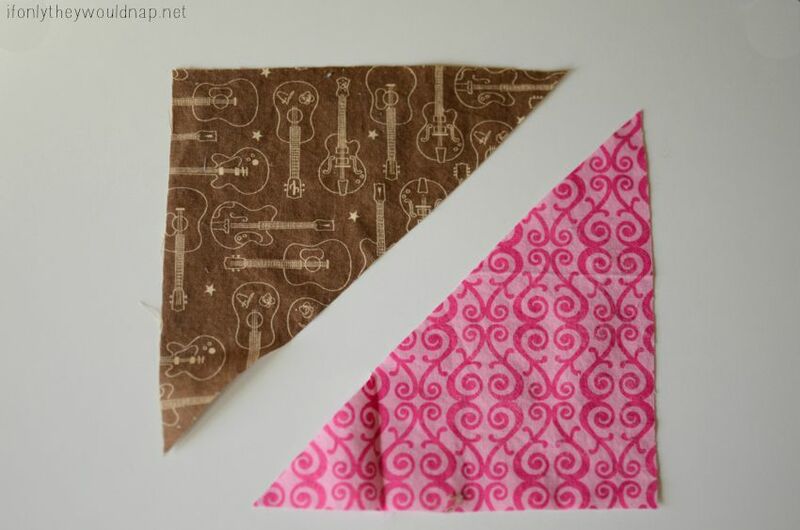 long, then cut them at a 45 degree angle (which is also known as “on the bias”) to make the triangle. 2. Sew pairs of triangles into squares unsung a 3/8in. seam allowance. 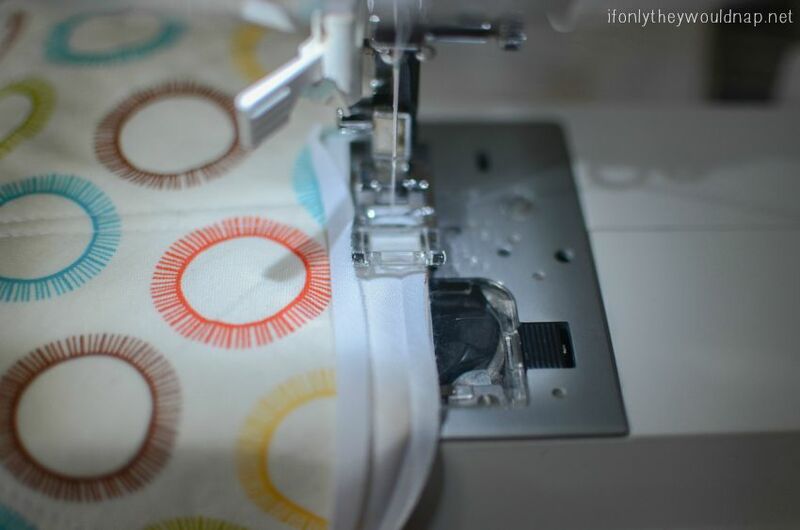 Press the seam allowance to one side and trim off the “tails” that are leftover at the corners. 3. 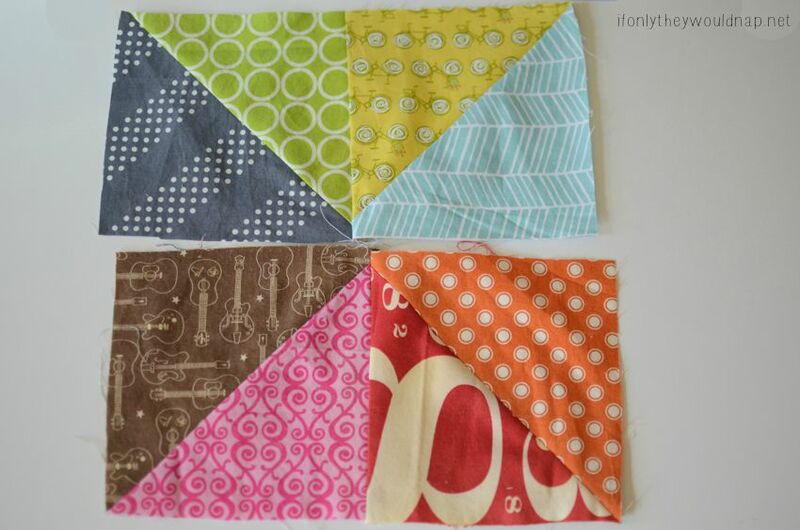 Sew two sets of squares together – make sure the points come together. Then repeat by sewing the two rectangles together to form one large square, pressing the seam allowances on each piece as you sew. 4. 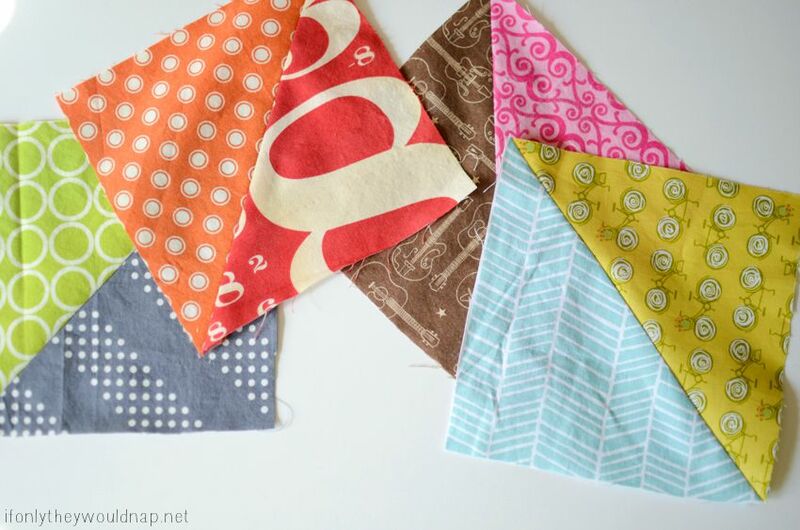 Cut a square of fabric and a square of quilting batting the same size as the square you just made. Sandwich the batting in between, with the wrong sides of the fabric against the batting. Pin or clip these pieces together. 5. Sew lines to quilt the batting in place. 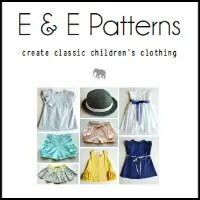 I sewed on either side of the seams, but you can do this in whatever design you choose. 6. Cut the square into a circle. 7. Now you’re going to add the bias tape. 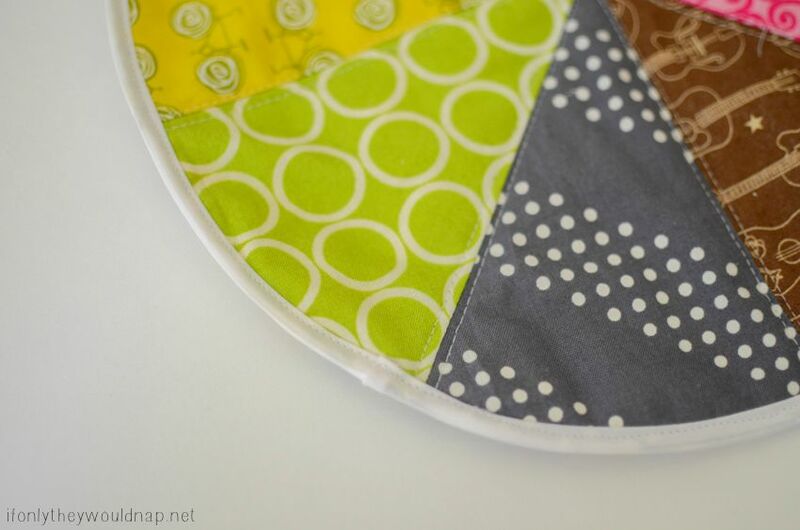 Open up and lay the bias tape onto the back side of the circle. 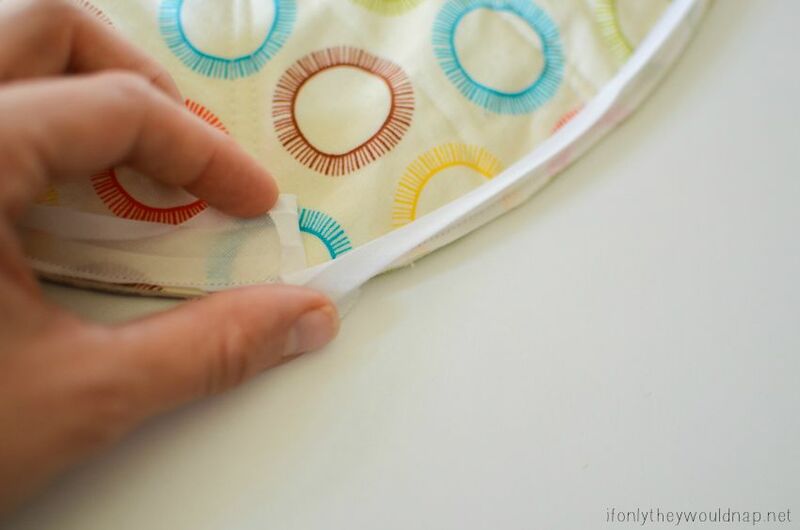 Begin sewing along the first crease — but make sure you leave the first 1/4in. of the bias tape NOT sewn down. 8. 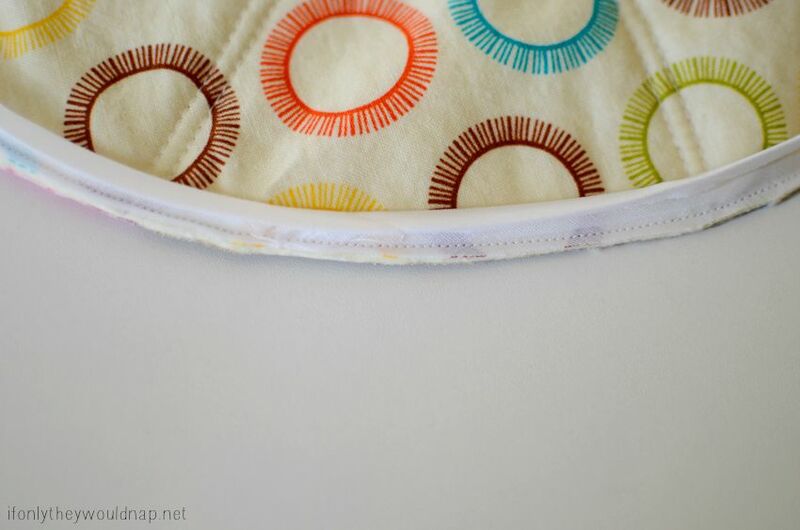 When you get almost to the point you began on the circle, pause your sewing to fold the ends of the bias tape back (toward the underside of the bias tape). 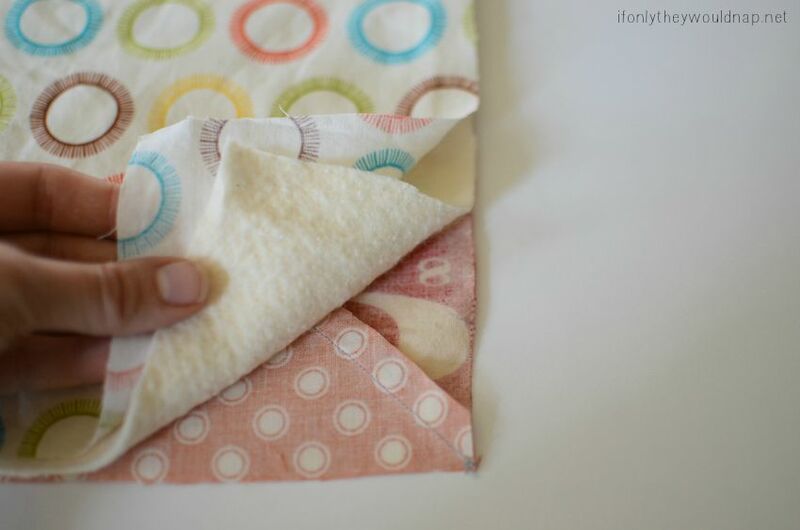 Do this with both ends of the bias tape. This makes sure that the raw edge of the bias tape is enclosed. Trim off any extra bias tape you may have. 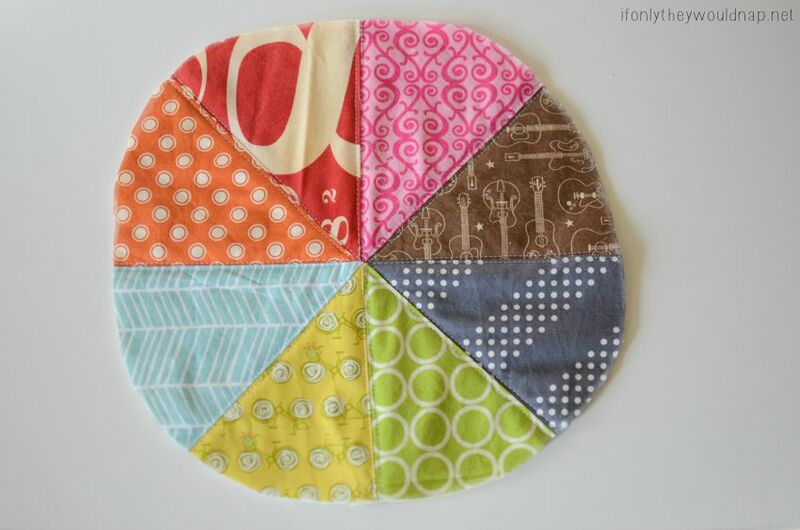 Finish sewing the bias tape onto the circle, over your folded ends. 9. Trim the seam allowance to be about 1/4in. Do not cut through your stitching! 10. Fold the other side of the bias tape over (the raw edge will be tucked inside) and topstitch it down from the top of the circle. The ends of your bias tape will be enclosed, as seen in the photo below. 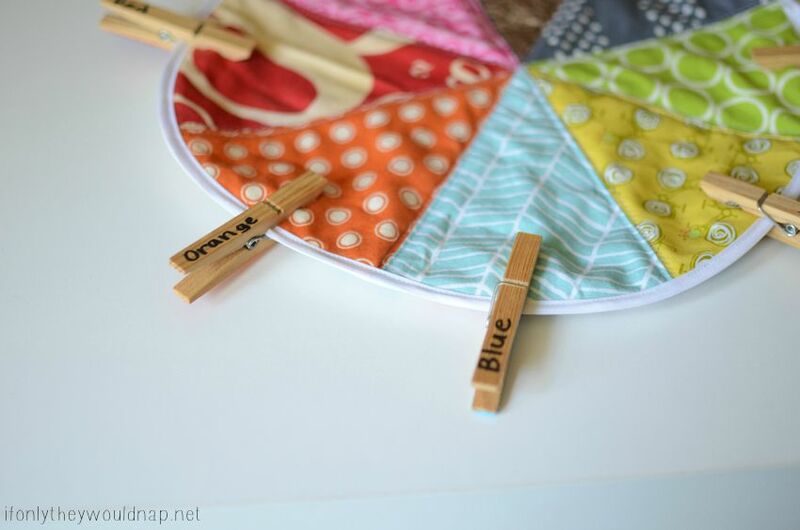 11.Take your clothespins and label one side with the color names. Then paint the corresponding colors on the opposite side. 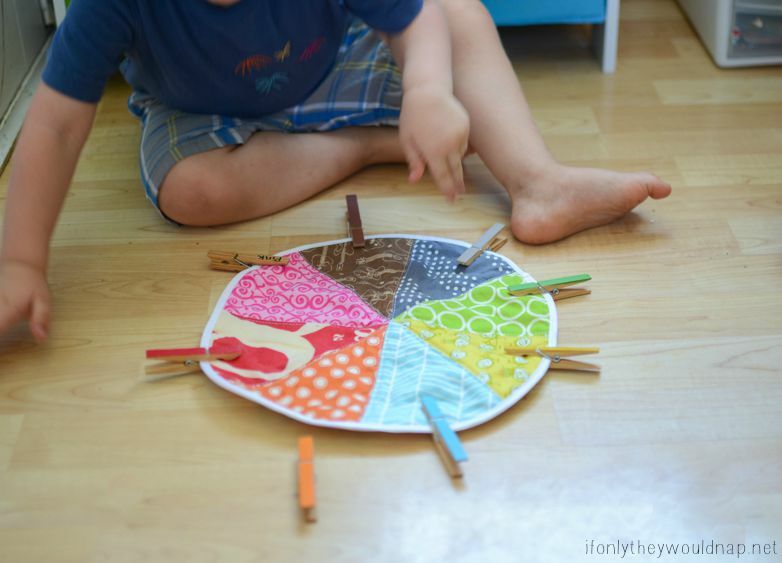 Then hand it off to your kiddos for color matching fun! 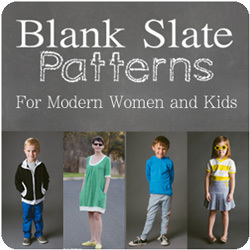 The color names are great for slightly older preschoolers or kindergarteners. 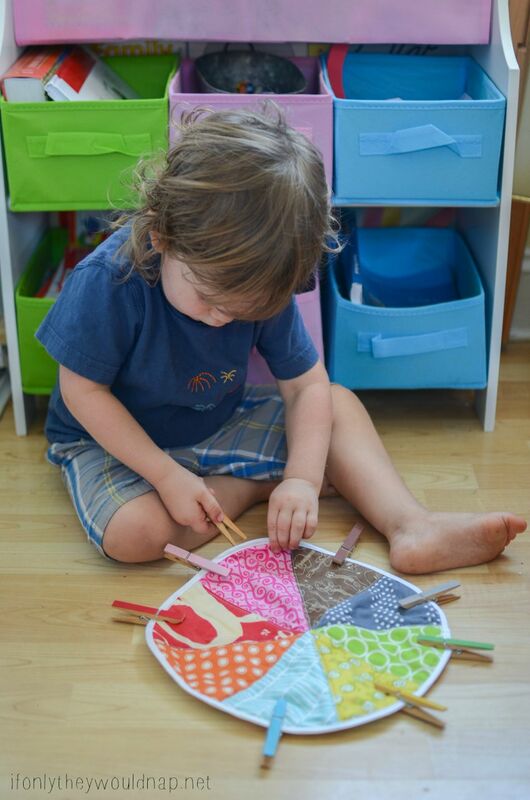 They can learn to recognize the color words, and they can use the painted side to check if they are correct. 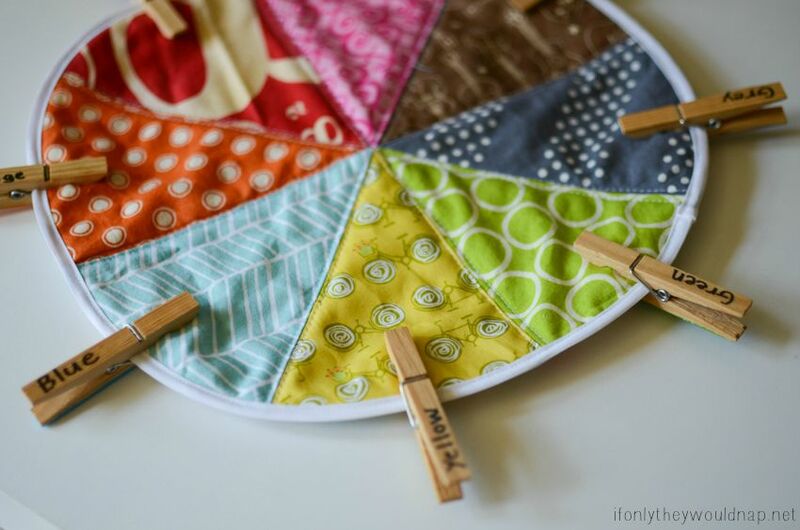 The clothespins can be tricky for young toddlers – use your own judgement to know if your child is old enough to use these correctly, and carefully supervise them of course. If your child is too little for the clothespins, use it without them until they are. They can still have fun pointing out the different colors! 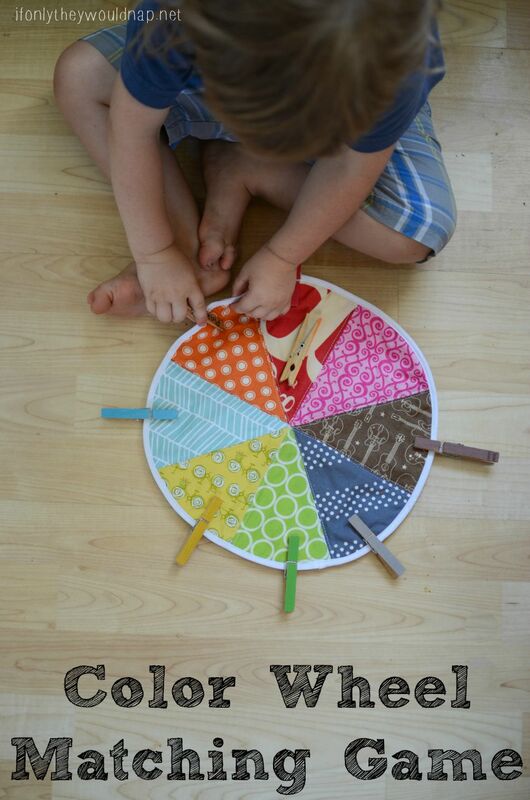 The painted side is great for toddlers and preschoolers who are learning their colors, and it can be played independently while you take care of other things around the house or even while you’re driving. 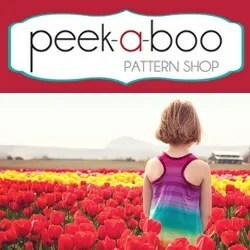 If you’re in the car, have your child point at things out the windows that are the same colors! 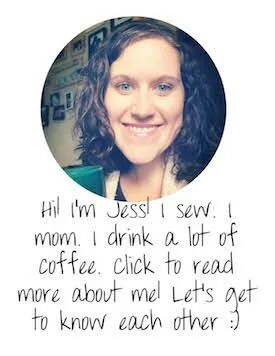 Next postWear to Where: Date Night!